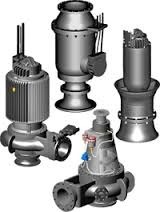 Beford Pumps is a Hidrostal company that manufactures a variety of Heavy Duty Dry Install Wastewater Pumps, Submersible & Immersible Wastewater Pumps and Submersible Axial Flow pumps for wastewater and flood control. This range features a more traditional wastewater design that features a shrouded, mulit vane impeller and is available in either a Dry-Pit/Bearing Frame design with mutliple instalation configuration in either a horizontal or vertical position. These hydrualics are also available in either Wet Well/Submersible or Dry-Pit/Immersible type featuring motors by Bedford Pumps. Materials of construction are standard cast iron, but we have great flexibility to provide alternate materials to meet your specification. *Mechanical Seals- Dual mounted within a fluid filled barriar chamber that provides lubrication and allows early warning detection of moisture intrusion. *Bearings- Pre-lubricated, heavy duty, angular contact thrust bearings & deep groove ball journal bearings designed for maximum life. *Sensors-Themal overload thermistors imbedded into motor windings. Moisture detection sensors are mount into seal chamber. Additional bearing temp probes or other options are available. 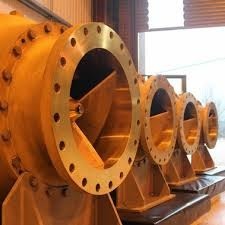 *Wear Rings-Both impeller and pump casing include wear rings to extend life and maintain maximum performance. *Impeller-High efficiency shrouded, multi vane impeller capable of handling solids and fibrous materials. Impellers are both statically and dynamically balanced to minimize loads and imbalance. 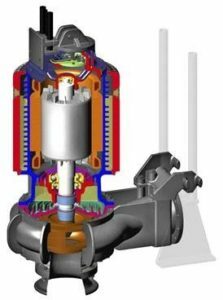 *Motor Cooling-Immersible motors feature a circulated oil bath. An internal impeller allows cooling fluid to pass a heat exchange are circuate around motor. This is a closed circulation system that does not utilize the pumped media directly.